Situated in the Great Lakes Region of Africa, Burundi is of major interest to multi-national corporations due to its rich agricultural land, natural resources and its strategic location near the some of the most mineral-rich lands on earth. Belgian and French neocolonial rule in Burundi involved stoking up ethnic tension between the Tutsi minority, favoured by Belgian colonialism and the majority Hutu population. Although the government has made every effort to reconcile the two communities, ensuring an ethnic balance in the military and state institutions, and notwithstanding the fact that there is no evidence of state-sponsored racial discrimination in the country, the Western corporate press have been attempting to create the impression that the Burundian government is threatening to exterminate the Tutsi minority. They do this by twisting almost every statement the government makes calling for calm and unity among all Burundians into incitement to racial hatred and genocide.The spreading of rumours that promote fear is a integral part of imperial destabilization techniques. 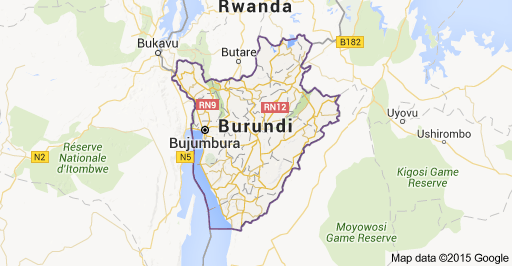 Amnesty International is now publishing serious accusations against the Burundian government in the corporate press. This is an organization which claims to be independent yet has counted among its board members former US National Security Advisor Zbigniew Brzezinski, who stated to French magazine Le Nouvel Observateur in 1998 that he couldn’t care less if the CIA’s backing of terrorists in Afghanistan had led to the deaths of millions of people as long as US geopolitical interests were served. Now the terrorist human rights organisation is sharpening its knives in preparation for the mutilation of another African nation resisting globalisation, resisting the Pentagon’s Africom, resisting neocolonial enslavement. Human rights organisations such as Amnesty International and Human Rights Watch are the avant garde of contemporary imperialism. They are, ipso facto, deeply complicit in genocide, war crimes, and crimes against humanity. These organisations provide moral justification for devastating wars of aggression that murder hundreds of thousands of civilians, rendering mullions more homeless and destitute. They are nothing less than evil doers and should be tried for their crimes by the Kuala Lumpur War Crimes Tribunal, the only credible legal entity in the world today for the prosecution of war crimes and crimes against humanity. This article was posted on Wednesday, December 23rd, 2015 at 10:07am and is filed under BRICS, Burundi, Corporate Globalization, Discrimination, Disinformation, Human Rights, Imperialism, Legal/Constitutional, NGOs, Opinion.